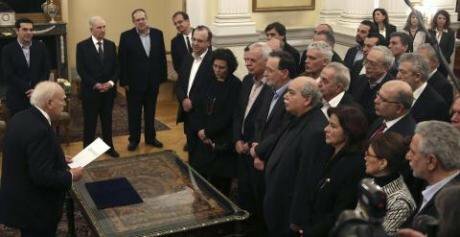 members of the new Syriza-ANEL government are sworn in by President Karolos Papoulias. Anticapalistes.net. Some rights reserved.On January 26, a new Greek government was installed: it consisted of the big winner of the elections on the previous day, the Coalition of the Radical Left (SYRIZA) and Independent Greeks (ANEL), a nationalist, populist party. The result puzzled many observers: why would a party of the radical left cooperate with a radical right-wing populist party? Takis Pappas has one explanation – we would like to suggest another. One cannot understand the Greek elections or government formation process without understanding the changing nature of the Greek political space. In the literature on European party systems, one model currently dominates. It has been put forth most eloquently by Kriesi et al. (2008): it sees two separate dimensions: first, an economic dimension that sharply divides the left from the right. This dimension concerns issues such as privatization, budget cuts and welfare state reforms. And, secondly, a cultural dimension that separates parties favouring national demarcation (closed borders, less EU integration) from parties favouring European integration and open borders. The reasoning behind this model is the following… Since 2010, from the point at which Greece entered its economic crisis period, was no longer able to acquire financing from the international financial markets and required two bail-out packages - one cannot think of economic issues without considering the relationship between Greece and the EU. These packages came with an agreements ‘memoranda’ between the Greek government and the Troika (EU, ECB and IMF) that dictated far-reaching budget cuts, privatizations and welfare state reform. This policy diktat fixed the main lines of Greece’s economic programme for a few years. What is more, accepting this policy was connected with remaining in the Eurozone and the EU both in the public debate and around the negotiation table. It also linked support for the memoranda and Greece's continued membership of the Eurozone to concrete economic measures, normally considered part of the left-right dimension: austerity policies became connected with remaining in the EU and one could not oppose these austerity policies without raising the question of a return to the Drachme which would necessitate leaving the EU. This division found very heterogeneous parties on the same side of the spectrum: on the side of those who opposed the memorandum and those who opposed the EU's far-reaching interference in the Greek economy, were the left-wing Coalition of the Radical Left (SYRIZA), the orthodox communist Communist Party (KKE), the nationalist and populist Independent Greeks (ANEL) and the extreme right Golden Dawn (XA). The centre-right New Democracy (ND), centre-left PASOK and newly established centrist Potami, wanted to respect the memorandum. The political mandate at the election was mainly based on the economy, as people grew tired of the prospect of continued austerity. The dominant line of conflict was not the left/right line of conflict but a dimension that concerned both economic issues (the privatizations, budget cuts and reforms endorsed by the Troika) and the question of Greece's role in the EU. From this perspective, a coalition government between the anti-austerity parties SYRIZA and ANEL not only makes sense, but is the one with the smallest policy distance on this dimension. ANEL is also with 13 seats the smaller potential coalition partner, allowing SYRIZA more manoeuvring space. At the same time, socio-cultural issues are no less pressing. Immigration, LGBT rights, and the church-state relation have played a major role in the political debate and the new government SYRIZA-ANEL government will have to propose legislation on these issues. On these cultural issues, we do find the traditional left-right division, but in Greece in 2015 the left and right divide no longer concerns economic issues (which have all been subsumed in the European dimension) but rather the division between those who favour a traditional, authoritarian and nationalist view of society and those who favour a more libertarian and cosmopolitan society. Cultural issues will be a major source of conflict for this Tsipras cabinet: SYRIZA and ANEL stand on opposites sides of the spectrum when it comes to immigration, citizenship, gay marriage and civil rights. The libertarian proposals by SYRIZA may well be blocked by their coalition partner, as ANEL would not tolerate legislation so far away from their main ideological lines. This explanation based on the dimensionality of the political space is not contradictory to the article written by Takis Pappas but rather complementary. Pappas suggested that rather than viewing the parties as arranged on a spatial dimension we should distinguish them according to whether they stand for, or against, representative democracy and which type of democracy, liberal or populist. What we show is that the economic/EU dimension reflects in fact exactly on this distinction. This new model may seem a peculiarity confined to these Greek elections under extreme circumstances, but the growing influence of the European Commission over budgetary policy in all Eurozone member countries may undermine the strength of the economic left/right dimension. As the European Commission sets the limits of economic policy all over Europe, it becomes increasingly difficult to think of economic issues independent of the question of EU integration.